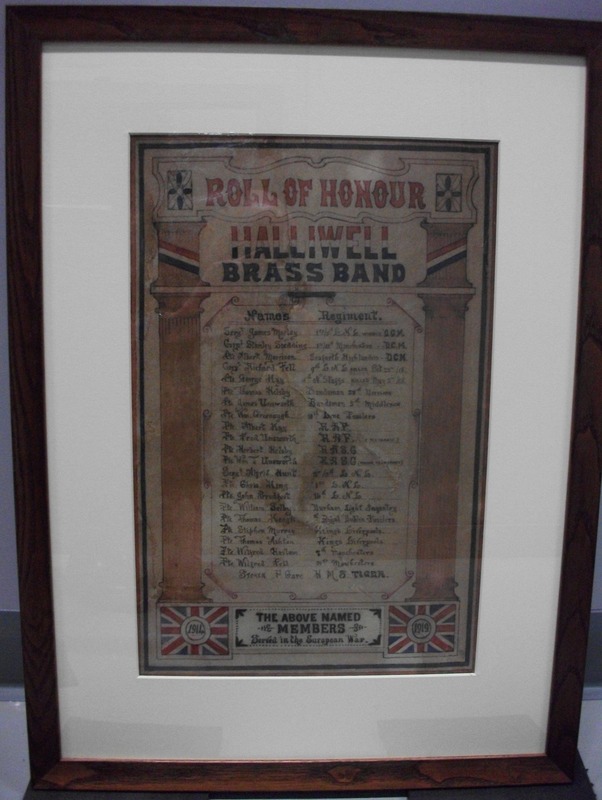 This blog post was written by Margaret Koppens, a volunteer at Bolton History Centre. The first mention of the Jubilee Band (later to become the Halliwell Band) is an article in the Bolton Chronicle dated 9th February 1828. 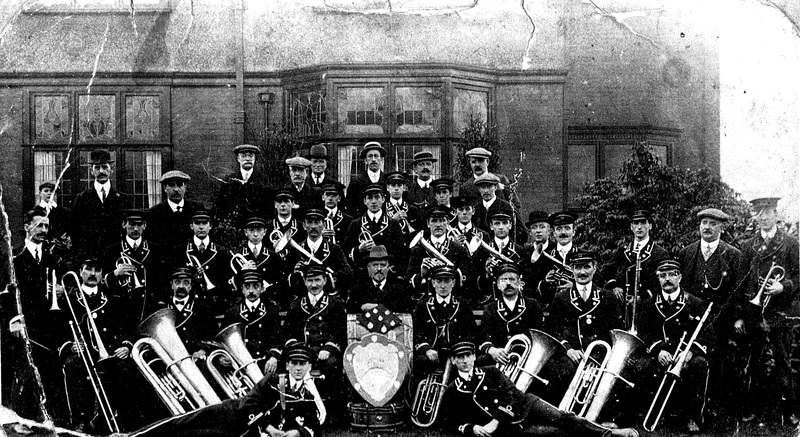 Some time before 1870 the band changed its name to Halliwell Band and practised at St Paul’s Church on Halliwell Road, Bolton. One of the first to enlist was Richard Ella Fell who was born in 1896 in Filey, Yorkshire, the son of Thomas and Ada Fell who by 1911 had moved to Bolton. He enlisted on the 8th September, 1914 with the 9th Battalion the Loyal North Lancashire Regiment and attained the rank of Lance Corporal. He was killed on the 22nd October 1918 and he is buried in the Honnechy British Cemetery, Nord, France and is remembered on the following memorials, Halliwell Brass Band, Bank Top U.R.C. Church and the Bolton County Borough Roll of Honour. When Lord Kitchener called for volunteers George Kay enlisted on the 23rd February 1917 at the age of 39 and was sent to join the Lancashire Fusiliers. George was the son of Jesse and Margaret Kay of Bolton and was living in Halliwell with his wife Ellen. In November 1917 George was wounded and invalided home, later returning to France to join the 5th Battalion, North Staffordshire Regiment. He was killed in action on the 2nd May, 1918 leaving behind his wife and three young children. 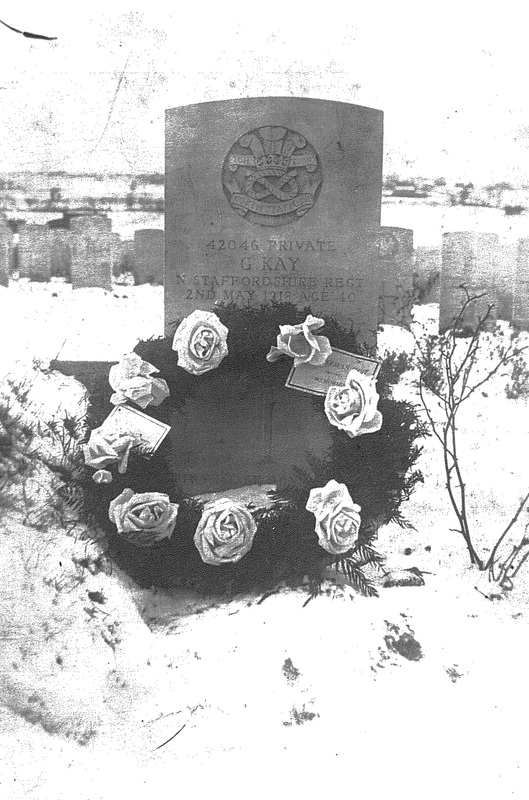 He is buried in the Klein-Vierstraat British Cemetery, Heuvelland, West-Vlaanderen, Belgium. 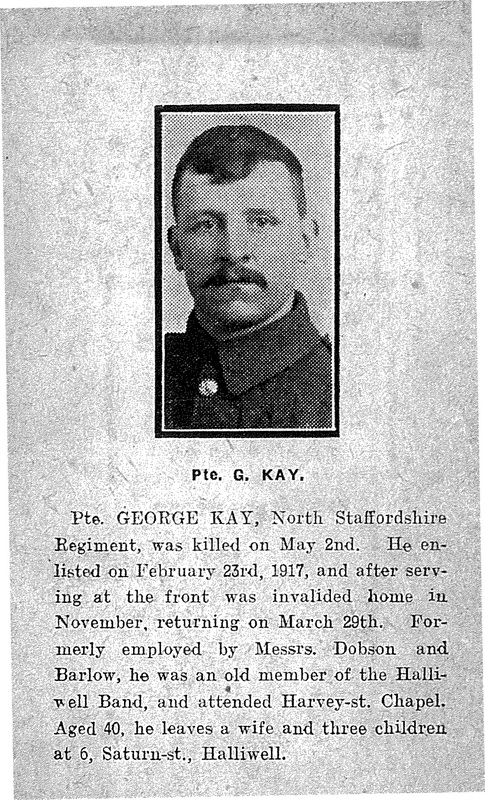 Private George Kay is remembered on the Halliwell Brass Band and the Bolton County Borough Rolls of Honour. Sergeant James Morley was the first band member to gain the D.C.M. and also the first member of the 1-5th Loyal North Lancashire Regiment to be so honoured. The medal was awarded for distinguished conduct on the field during March, April and May 1915. He was a veteran of the Boer War serving in the King’s Own Scottish Borderers where he gained two medals with clasps and had the rank of Sergeant. James was married and lived in Halliwell. Sergeant Albert Morrison was a drill instructor to the King’s Hall Boys Brigade, Bolton before he enlisted during the recruiting campaign in Bolton in January 1915. He joined the Seaforth Highlanders and was sent to France. He was awarded the D.C.M. in June 1917; the citation reads as follows – ‘for conspicuous gallantry and devotion to duty. Whilst holding an advanced post he was attacked in superior numbers, but with quick initiative he grasped the situation and successfully repulsed the enemy advance. Later on he was outflanked, but he skilfully withdrew his platoon and reinforced another portion of our line’. Albert was married and lived in Halliwell and employed at the Horwich Locomotive Works, Bolton before the war. Corporal Stanley Spedding was the youngest of four sons of Thomas and Mary Alice Spedding of Halliwell. Stanley was baptised on the 6th August 1899 and he enlisted in the 2/5th Loyal North Lancashire Regiment in February 1915 to join his three brothers who were already at the front. In March 1916 he was discharged when it was discovered he was under age; however he enlisted again in July 1917 when he was 18 years and one month old. The news that he had been awarded the DCM while serving with the 1/10th Battalion Manchester Regiment at Reincourt was announced in the London Gazette dated 5th December 1918. The official record reads as follows – ‘In an advance he was in charge of a Lewis Gun Section in the second wave. Seeing the first wave held up by machine gun fire, he at once worked his section round on the right flank of the platoon, and getting to close quarters silenced the enemy guns. He then pushed rapidly forward and was able to cover the advance of the platoon to the objectives. His example of courage and coolness was exceptionally high’. Stanley lived with his parents in Halliwell before enlisting and was a railway employee. All the Spedding brothers survived the War. At the end of the war the surviving members of the band returned home to their loved ones and the band was reformed until the 1950’s when they dis-banded.